The Tuffmaster II range of safety helmets offers impact protection against a wide array of falling hazards. 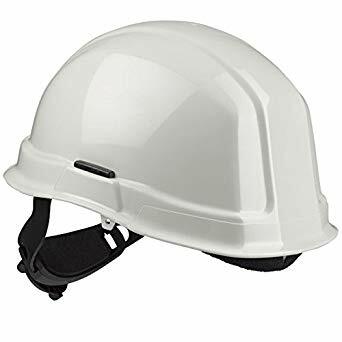 Stability on the head, long duration comfort and ease of connecting additional face and hearing protection are the hallmarks of all Sabre Safety helmet designs. Traditionally styled, Tuffmaster II can be specified in durable ABS or high heat Polycarbonate shell materials and reduced peak versions and standard or ratchet adjustment on the ABS variant. The Tuffmaster II has been designed to meet the requirements of EN397 for shock absorption, resistance to penetration, ignition by flame, and electrical insulation and is suitable for use in a wide range of industrial applications that require the use of head protection. ABS and PC belong to polymers recycling category 7. Please see local authority regulations for disposal advice and locations. Sabre Safety helmets are designed and tested to the requirements of EN397, with clear guidleines that helmets must be worn in the correct orientation with the peak at the front and the size adjustment mechanism at the rear. A helmet's headgear should never be removed to reverse its orientation; if this advice is ignored there can be no assurance that the helmet will meet its certified performance. Applications that require a reduced peak can be satisfied by specifying the Tuffmaster II reduced peak safety helmet, which is ideal for working in confined spaces or at height where greater vision is required. Sabre Safety helmets are designed with a universal 30mm accessory slot to enable the connection of a wide variety of face or hearing protection. The HC750 is the exception to that with a 25mm accessory post. The range includes a comprehensive portfolio of face protection, passive and electronic hearing protection, sweatbands, chinstraps, replacement headgear, hygiene and winter liners.